This is a guest post by guest author Vern Marker. The challenges facing business today, everyday, are not so dissimilar from those a generation or two or three ago. The equation is actually rather simple. Open a business which performs some sort of service or sells products. The delivery of those products or services may be to consumers or perhaps other businesses. Once the capital has been invested and time taken to develop plans of action the company needs one single, crucial element in order to have a fighting chance of staying in business and succeeding. What is that all-important aspect which is required for success? The customer. Ever since the concept of charging for one’s wares came into existence, the concept of having someone to sell to was along for the ride. Somewhere along the evolutionary line of business development the saying “The customer is always right” came about, perhaps much to the chagrin of those providing customer services. Today, it might be more accurate to say the customer is always right, sometimes. Some may be more right than others. So how is it that modern businesses employing the Internet with its vast spectrum of resources can figure out which clients are the most right, which need a bit of hand holding, and which customers should be fired altogether? Enter the opportunity presented by social media websites. Just 5 or so years ago, these online destinations were in their infancy and really hadn’t started maturing to the level of becoming viable business resources. Today, one might have to look far and wide for an individual who has not heard the likes of Facebook, MySpace, LinkedIn, Twitter, to name a few of the most popular social sites online. Even though these communities have been built and millions of users have come, are they necessarily required for the successful use by businesses large or small? The challenge faced is determining where to put ones business budget in order to see a quality return on investment of both time as well as money. With few exceptions, creating and maintaining a presence on Facebook has almost become the default standard any business or organization must undertake. The great news here is that the communities using this social site count into the hundreds of millions, are located around the planet, but also have the distinct flavor found in local community organizations. Twitter can be effectively used by many businesses provided they exhibit just a bit of restraint. When a tweet comes from a business it should either be about helping its current customers – or on a very limited basis be marketing deals or great opportunities. As soon as the volume of Twitter messages becomes overwhelming, followers will block the business from sending anything more to their message list. For companies dealing mostly with other business, LinkedIn should not be passed by. Also, human resources professionals can find tens of thousands of potential candidates for job openings within this social community. One interesting area of social media which has been growing rapidly for only a couple of years is called geo-local services. Essentially, these websites are using services like Twitter to broadcast a user’s physical location to their friends and followers. From a business perspective, geolocal social sites provide members with access to specials and great deals only found when using the social community service. Additionally, users can easily send messages to their friends located close by, effectively bringing you more business. The best advice to give curious businesses considering social media sites is do the work. Once a platform has been chosen, become effectively active. Not too much, not too little. Provide real answers to those asking questions about the company’s products and services. Though determining ROI precisely can be a challenge, the word of mouth generated by social media is inexpensive, and can be quite effective. I absolutely agree that social media is an appropriate way to share your business. Less hassle, convenient and it’s really helping. Yes i agree with the other who says that you must then be active in that social media you have been registered. Twitter, WordPress blogs, and Facebook combine for an unbeatable business combination. It is kind of a generalizing to set the “Best SM for business”… I mean every business has its own unique needs, and depending on the defined targeted audience that the business owner wants to reach, the social media should be picked. So the general rule, where a business owner would like to have presence is to look where his/her targeted audience are at and then make an effort to be a significant player in that social media site. I guess I’m not speaking from complete experience, but I would say that online marketing is not nearly the challenge of traditional marketing. Just look at all the avenues you’ve listed in just one post! Depends on what you mean by business opportunities and exactly who the market is. Facebook does seem to have a good handle on very targeted advertising. For example, I put into my profile that one of my hobbies is sewing and now I get ads for fabric. I think that’s very clever because those ads actually interest me! It’s not based on my broad-based demographics like my age or income- although I get that too. For example, the other day there were anti wrinkle cream ads (based on my age I guess) and and ad for the Killers (based on my ‘alternative music” profile I think) . But there are limits to how businesses can use this information. Not many people will tell you their hobby is CRM mgt. Certainly LinkedIn is a great business networking site. Twitter is interesting. There are people who follow me and I don’t know why. I follow people/groups that interest me. But it’s not a destination like Facebook and LinkedIn. I use Facebook for personal use, LinkedIn for business and Twitter cause I’m trying to figure out what it can really do. Myspace seems to be the music destination and YouTube the video one. Sites like Classmates and Reunion (now MyLife.com) seem to have focused on selling premium memberships rather than building value in the site on its own merits. LinkedIn provides a lot of value even without a premium. A copied comment spammer left this excerpt from Tom Gray’s Evolving Internet Marketer blog. It was such an interesting suggestion that I kept part of the excerpt and linked to the source. “I believe that the basic 4 are LinkedIn.com, Naymz.com, Ecademy.com, and Facebook.com. That is where everyone needs to start. Then the blogging and micro-blogging sites like twitter.com and plurk.com are wonderful to building relationships and credibility. I believe that each person has to find their favorite or most comfortable site to dig in and network and do their business the most good. Realtors have activerain.com, for example. Professional speakers do well with speakersite.com. There are so many. Because I use social media every day, youtube.com and blogtalkradio.com are critical to my success, and the networking aspect is wonderful on both of them. Visit his post at the link above to read the rest. I still see social media like FB more like an extra service. Making it a bit easier for the customer to get an answer. If people don’t know you then they won’t find your fb page that easily. It helps when people like and become a fan of your business page. But for that to happen there should be a good relationship between you and the customer already. Though internet visibility is very important, so if you have the time it’s an easy thing you can do. Now that google has new fb like feature. I think Fb will begin another additional features in their site. This is good for business owners to reach more people . Very nice covering topic. I am not at all surprised that Facebook is at the top and in a higher rank than twitter. This is only because Facebook attracts people from all over the world by its varieties of applications and for “easy to use” feature. It’s very easy to make friends there. It makes every thing much easier and faster.It shows what a good social media site should be. Thanks for sharing. 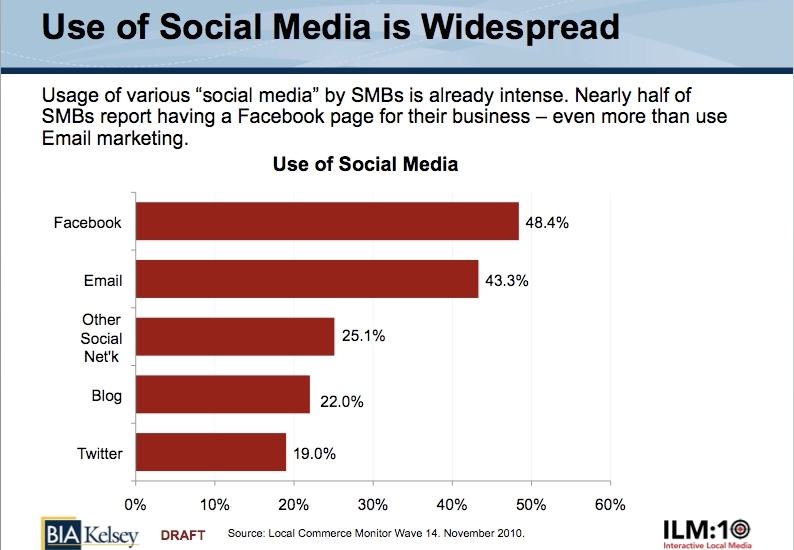 Although Twitter is good for the business exposure, I like Facebook more. It is because most of my traffic came from Facebook. I haven’t tried e-mail marketing and other social networks strategy. I like the idea that the customer is important aspect which is required for success. Seth Godin has answered the question of Social Media and businesses recently. Just go to youtube and search for it. His answer is quite enlightening! Nice article. We try and use all avenues for several different businesses, including facebook, twitter, blogs, local services, and commenting on others blogs. We communicate a lot. Of the businesses this one has the most facebook followers. We were surprised to here from a marketing firm that is a 3rd party fb ad seller that haven broken over 1,000 followers we have hit a threshold that is difficult to achieve. Didn’t know that. I’ll say this it took over 1.5 years of consistent work. A 2nd thing we noticed is that we appear to have more fb fans than any other such business. It takes a lot of work and time. That is the biggest difficulty from the perspective of the business. In this business type, to date, we have found that the most important element is our website. Its where intent comes in from people thinking about the service. We link back and forth between the site and the fb page. Traffic of some levels flow between the 2 sites. Frankly we are very much on a learning, evolving path…..and expect to be in that capacity for some time. Wow! To be honest I would have thought Twitter would have been more popular than Facebook, how wrong I was! Great article – interesting and informative! I am not surprised that Facebook is at the tops but i am expecting a higher rank for twitter… Anyway, whatever is first or second, social media as a whole made business operations a lot easier and faster. Facebook now become the #1 social media and there are a lot of free traffic that you can have by many ways. Why not try it ? Social media z the perfect way to increase website traffic! I am actually a little surprised at how low twitter scored. I would have thought that (done by your stated guidelines) Twitter would have a far greater reach into business. Steve, the reason for this is because Twitter is highly prevalent in all industries where most of the participants are tech savvy. If you think about the whole spectrum the results seem about right to me. @Social Puma It will change in the future, and probably fairly quickly! That’s why it’s so important to keep up with trends, articles, news and information. But it’s fun! @seocoaches Well, it can be a time drain, sure, but worth it in the long run. The way I see it, too, is even if a customer/client says something “bad,” it’s an opportunity to interject yourself into the conversation and rectify the situation. It’s really nothing new (e.g., mail/letters, telephone, e-mail, etc. ); now we’re just afforded the luxury of talking directly to customers. I just love how social media marketing works for my business. I bet a lot of small business owners love it too. No wonder why Facebook ranks at the top. Social media marketing through Facebook is sky rocketing in just a matter of few years. Amazing! Nice stats there.I feel that social media is going to be a dominant force in business in the near future.It has so many features that we can utilize it anywhere in the market. “Once a platform has been chosen, become effectively active. Not too much, not too little. Provide real answers to those asking questions about the company’s products and services.” I think this is the best advice in the entire piece. There’s nothing worse than a dormant Twitter or Facebook profile…particularly if it’s a company’s! Social Media can be a very effective means to acquire/retain business, as long as it remains authentic and transparent. Although digg is not listed above but it is also a good network. I use digg and consider it better than any other. Great post. While we are not as powerful or influential as twitter/facebook heck us out at FoundTown (www.foundtown.com) We recently expanded outside of our beta cities and provide a platform for businesses to create a social profile in their city – hyperlocal aggregation of social updates from local businesses..
Facebook, Twitter, YouTube and Blogs are top social networks used for present day businesses. I think companies should look at social media and how best it fits with their company, although I agree Facebook is the most popular – it might not fit with every company. As mentioned above already I am surprised LinkedIn doesn’t rate higher – I would be interested to see a comparable now, 6 months on, to see whether anything has changed. Facebook is certainly the leader now. But I would love to see LinkedIN coming into Business as it is a professional network for a reason. What are “other social networks” in the chart? The conclusion nailed it. You have to be active with social media or its never going to do anything. And its not just something your marketing intern can handle on a part time basis. It needs to be a priority for someone to make it effective. I am not surprise with facebook being on top. Facebook is so huge with thousands of new users who are registering on the site daily. It’s simply amazing. Pretty soon facebook will outgrow Google in terms of traffic. The companies or organizations that do not adapt facebook into their marketing plan is bound to fail sooner or later. “Twitter can be effectively used by many businesses provided they exhibit just a bit of restraint. When a tweet comes from a business it should either be about helping its current customers – or on a very limited basis be marketing deals or great opportunities.” – I’m not sure whether I fully agree with this statement. It is important to tweet about these things you mention, but I think it’s equally important to tweet interesting area-specific articles/information. For example, I work for a software company. I don’t limit myself to tweeting solely about our company and the software products we offer, but like to find interesting articles about technology, social media, etc, too. It’s important to promote your business, but it’s equally important to let your personality show and have fun (and let your customers know you have fun and enjoy what you do). For me the main social websites Facebook and twitter. maybe because of my niche (Forex) social bookmarks and SN are not so useful. good to see social media sites influence business so much on the internet, facebook is popular anyway and deserve the top spot, however i guess linkedin and twitter will increase further and take up the 2nd and 3rd soon. In the past when social media circled around digg, choices were very narrow, however in the present times it is not just available in plenty, it is absolutely affordable as well. It is certainly interesting how social sites have taken us by storm. I saw a recent poll about how we communicate with friends and family and the number one was facebook, followed by text messaging, email and then a distant fourth was via phone. Quite a dramatic shift from only a few years ago! Social media is something that should be consider as a second way to market but I like the fact that you can market through SEO links. It seems that works better for me!! I use Facebook for my local real estate business and I have seen an incredible amount of growth just from Facebook! I agree with the chart! I’m not surprised to see Facebook at #1. Several local businesses in my rural area of northern California make really good use of Facebook, especially restaurants. I’m a bit surprised that LinkedIn doesn’t make the list. I’ve been putting more effort there lately and it’s starting to pay off. I still can’t get some of my SEO customers to create (or let me do it) Facebook pages – they worry about the time-drain and the risk of getting a bad reputation via bad customer complaints. How to convince them it REALLY is worthwhile?